check the construction for correctness. Moreover, tracks of points or polar sets of lines can be generated to establish new conjectures and gain geometrical insights. With functions, curves and expressions, C.a.R goes far beyond compass and ruler. With the powerful macros very complicated constructions can be explored. 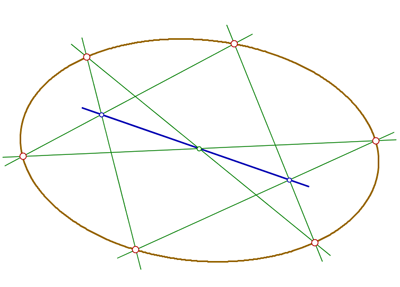 Other geometries, elliptic or hyperbolic, can be explored too. Graphics can be exported in various formats. Constructions are saved in an open XML based format, and the program itself is open sourced under the Gnu Public License. C.a.R. has been developed by René Grothmann from the Catholic University of Eichstätt. Pascal's Theorem - Demonstrated with C.a.R.